Yale University researchers just turned tech around. Robots are usually rigid, solid and built for specific purposes. According to the Yale roboticists, their robotic skin is breakthrough innovation and can change everyday objects into robots and animate the inanimate. NASA partnered on this research with the lab of Asst. Professor Rebecca Kramer-Bottiglio and her team of mechanical engineers and materials scientists. 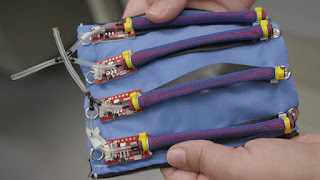 The soft robotic system is a collection of sensors and actuators. It's mounted on a flexible substrate that's placed on a flexible object that serves as the structure. The scientists say this tech will allow you to create multi-functional robots. For instance, when placed on a toy horse, it can make the horse's legs move. The researchers say it can be used for everything from search and rescue to wearable tech. NASA wants to use it to reduce weight on its spacecraft. The robotic skin is flexible and can be moved around to perform a variety of tasks. This tech is being developed and shows a lot of promise.